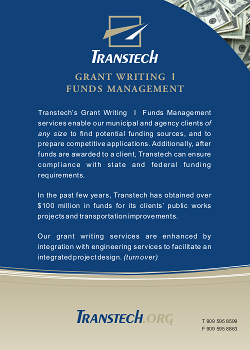 Our Grant Writing and Funds Management services enable our municipal and agency clients of all sizes to find potential funding sources, and to prepare competitive applications. Additionally, after funds are awarded to a client, The Firm can ensure compliance with state and federal funding requirements. In the past few years, The Firm has facilitated over $100 million in funds for our clients’ public works projects and transportation improvements. Transtech has developed an internal electronic procedural tracking system to fast-track, coordinate, and organize federally-aided projects. This multi-layered system is process-oriented and developed over a timeline—a steady departure from the topically based and more general approach of the Caltrans Local Assistance Procedures Manual. The system provides swift results by ensuring that a project stays fully on track and is carried out in a timely and efficient manner, while providing personnel with all key reference points, timelines, and resources to complete and track the various ongoing projects. Every step in the transmittal process is reviewed, tracked, and updated. The tracking system also includes follow-ups on federal application forms, which are subject to change after submittal and must be updated so as not to hold up authorization of funding. Our grant writing services are enhanced by integration with engineering services to facilitate an integrated project design. This expedites project start-up and completion, and ensures compliance with funding requirements. Our service is so valued by our clients that our Funding Specialist is supported by several staff members including a Planning Specialist, Transportation Specialist, and an Administrative Analyst always having access to CE and PE input when necessary. Find out how Transtech’s services can help your organization to achieve success.